We believe life is about taking your shot. It’s about sharing your soul with the people who care to listen, not selling it to whoever will buy it. And call us old fashioned, but we do still believe that hard work is the only path to true reward and all the celebration that is earned with it. That’s why our shareholders aren’t share traders on some faceless stock exchange. Our shareholders are the people that share themselves on stages around the world every night. Our shareholders are the musicians that share their soul in every note of every song at every live performance. Our shareholders are the action taking athletes who risk every bone in their bodies to continually shatter the perception of the limits of human capability then celebrate their triumphs among the friends who helped push them there. And our shareholders are the people who work tirelessly behind the scenes to make each of those treasurable moments even possible for the rest of us. That’s what we believe fine spirits are truly about: celebrating the greatest moments in life with true friends. So that’s what we strive to put into every bottle of COLDCOCK American Herbal Whiskey. So whether that bottle is opened to set the right mood for the perfect evening of live music or to celebrate a small or great personal achievement, we believe we’ve shared our heart and soul in concocting a fine spirit to make each of those moments even better. So, here’s our best to whatever you raise your glass for… TAKE YOUR SHOT! 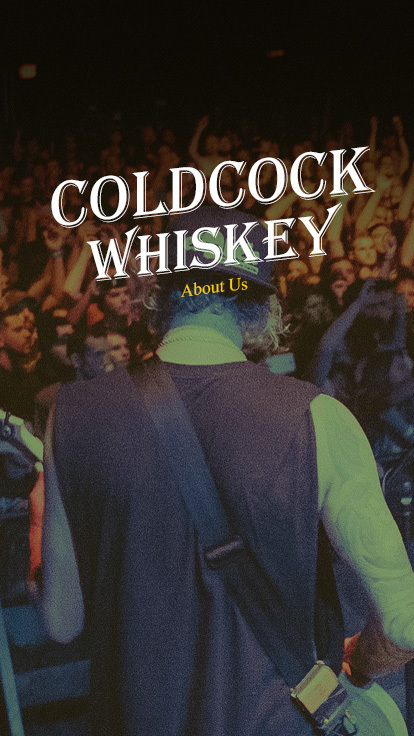 COLDCOCK is American bourbon blended with herbs including green tea, hibiscus, ginger, eucalyptus and many more. When we infused great tasting herbs in our bourbon, we never expected them to completely take away the whiskey burn, but leave the whiskey taste. So rather than adding extra sugar to make COLDCOCK smooth, we simply added great tasting herbs from around the world. The result is the easiest whiskey experience you’ve had.